Several members of the Nigeria Football Federation (NFF) executive committee and some secretariat staffers have been ordered back from the Championship of African Nations (CHAN) in Morocco. The staff were said to have arrived Morocco on Saturday night, but were forced to rebook their return tickets after it was alleged that the sports ministry maintained they are not part of the N500m budget the federal government has for CHAN 2018. The sports ministry, not the NFF, is in full charge of Nigeria’s participation at the CHAN in Morocco.It was, therefore, sports minister, Barrister Solomon Dalung who ordered that the CHAN Eagles be paid a win-bonus for their goalless draw with Rwanda. 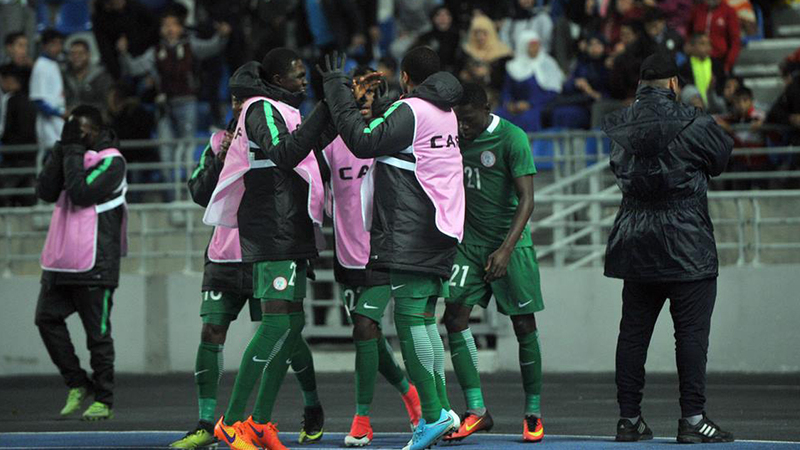 According to sportsdayonline.com, a lot of questions have already been raised about the 500 million Naira budget approved by the Federal Government for the home-based national team at the CHAN. “It’s rather embarrassing that the NFF officials as well as staffers will be heading back to Nigeria after only a night in Morocco.“Some of them have already reconfirmed their return tickets and will be leaving with the next available flight,” a credible source disclosed. Meanwhile, Morocco and Libya will meet for a North African derby in the first semifinal of the 2018 African Nations Championship tomorrow evening. The match is set for the Stade Mohamed V in Casablanca, kick-off at 6.30pm CAT. Hosts Morocco have enjoyed a great run to the final four of the continental tournament, topping Group A before they ousted surprise packages Namibia 2-0 in the quarterfinals this past weekend, thanks to goals from Ayoub El Kaabi (his sixth in the Chan) and Salaheddine Saidi. “Before the match, we trained for all possible scenarios. We analysed the Namibian team very well. We identified their dangerous players and made sure that when we play, we find ways to stop them and we did,” coach Jamal Sellami said. Libya have had a mixed run to the semis, with their group stage campaign marred by a defeat to Nigeria, while their quarterfinal victory over Congo on Sunday night came via penalties.The teams were locked 1-1 after extra time thanks to goals from Libya’s Saleh Al Taher and Congo’s Junior Makiesse, before the Mediterranean Knights won the post-match shootout 5-4. Coach Omar Al-Marimi has cajoled his side to better performances throughout the tournament and will be hopeful that the prospect of a regional derby against the Atlas Lions brings the best out of his players. Morocco and Libya have met in 11 official matches according to Fifa’s statistics database. The Atlas Lions have claimed five wins compared to two for the Knights. Morocco won 4-0 when the teams last met, a friendly match played in Rades in October 2015.